Sometime on Good Friday, the Goddess Temple in Cactus Springs, Nevada was invaded by thieves. The space that had always been open to anyone wanting to come visit the Goddess, to pray and to enjoy the peace of the sanctuary could do so unhindered. It was this that made it possible for those with a more heinous mission in mind to succeed in stealing the centrepiece of that place, a four foot tall statue of Sekhmet that weighed under 100 pounds. The Priestess in Residence came into the Temple to find Sekhmet gone. 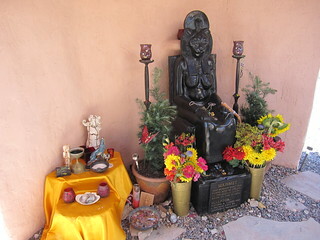 The thieves had left behind only tire tracks, and in them was the necklace that the statue had been wearing, indicating that she had been tipped while being spirited away in the night from the place that had been her home for the last 21 years. For the celebration of Earth Day that was scheduled to be held at the Temple, a picture of the statue was set in the place of where the image once stood. The Earth Day Celebration went on as planned. Right now, there is much speculation within the Pagan community as to why it happened or who might have done it. The first thing that came to mind is that somehow, since it was done on Good Friday, it was religiously motivated, as if to remove an image sacred to those who are not a part of the Big Three monotheistic faiths. Others have suggested someone just wanted to make Sekhmet their own. Others have posited that because of the area of the country and because Sekhmet personifies power itself, that the culprits could be drug dealers who believe that stealing a bit of mojo is perfectly acceptable. Whatever the motivations are, the Pagan community and all those who love Sekhmet are upset by the theft. Initially $500 was being offered for information that led to the arrest and prosecution of the culprits. That has since been kicked up to a $2,000 reward. I would not be surprised if that figure increased yet again. The unfortunate byproduct of this tragic event are those Pagans who wring their hands and drape themselves over the furniture, wailing that this is about religious persecution – or that if this had happened in a Christian church or Jewish synagogue, the press coverage would somehow be more than it has been. I understand the deeply personal feelings that people have toward Sekhmet and that someone would do something so terrible is frustrating and brings up anger, sadness and the overall feeling of somehow being violated. I also know what it feels like when the issues and events we hold near and dear are not adequately covered as we feel they ought to be. I think anyone who is on the receiving end of being even in a small way touched by any sort of crime – be it a hate crime or something else must feel that irritation that no one could possibly understand. Pagans in particular, seem to love to latch on to crises of this type because it makes them feel as some “persecuted other”. I never saw much use in wallowing in that sort of self-pity, personally. To be honest, I never thought I would see the day Sekhmet’s children would resort to playing the victim card and yet I have in these past few days. Some have resorted to comparing and contrasting our religious site being desecrated and comparing our pain to the pain of others when thier faith was lashed out against. Somehow they conveniently have forgotten in another crime that is unrelated but took place just before Easter where three innocent lives were lost last week during Passover. Ironically, all three of the victims who were slain by a white supremicist were Christians. It is my view and in the interests of ma’at that I believe that no one should be singled out, begrudged or feel persecuted for their beliefs, or have their sacred spaces violated. The ones who whine about how we of “Other” faiths that are not Jewish, Christian or Muslim are so very persecuted and discriminated against conveniently forget the burned churches, the desecrated mosques, the ravaged Sikh temples, that have all have been the scenes of senseless violence and desecration, all based on hate and intolerance. Our prayers go out to their families and our voices whisper hopes toward peace and understanding. It is what we should do for each other as human beings. We are not the dominant religion, that is true. We are not Jewish, Christian, or Muslim, but we can practice our religion for the most part unmolested. Do people lose their lives here over being pagan? Hardly. That is what the comparison with the Passover shootings was about – and it is relevant. Can people in India, Africa, and even Egypt itself say the same? Absolutely not. I know of native Egyptians who do worship Sekhmet – but they cannot do so openly or it is a death sentence. There is no point to the practice of comparing and contrasting of pain and transgressions and tresspasses against “Us” versus the ones suffered by “Them” – whichever side we happen to be on. Any religion being oppressed, any desecration of a holy site is an outrage and intolerable. As a Priestess of Sekhmet, I ask is our suffering any greater than the churches that get burned down, the mosques that are desecrated, the medicine wheels that are destroyed? No. Absolutely not. Whomever did this – be they someone who lusted for Sekhmet’s image itself, or someone in the drug cartels or someone just doing something ignorant and hateful, I can say without reservation that they will have literal hell to pay. In spite of Sekhmet’s loving, healing aspects – and She has many – there are very dark parts of this Goddess that are invoked when Ma’at has been transgressed. To those who know Sekhmet and those “darker” aspects of Her, know without any shadow of a doubt that the move was a very stupid one indeed. That statue will be returned – or not. But we are undamaged, and Sekhmet’s worship is undeterred. One thing is for certain, however, those who stole Her image will get what they have coming to them. I know for a fact, Sekhmet’s Arrows Do. Not. Miss. In my years of experience, Sekhmet, as far as Deities go, is most definitely NOT a victim; and neither, I dare I say it, are Her children. We will not curl up into a ball and wail and bemoan the situation. We will not stop doing what we have been doing since the resurgence of Sekhmet’s worship in the world. We know who our Mother is, and She knows us. We who know that we belong to Her carry Sekhmet within us. Our minds hone in on Her with a singular focus. We do this because She IS the very Personification of Power or Sekhem itself. To succumb to this blow is to give that Power away. Rest assured, we have absolutely no intention of doing that. Unfortunately, however, studying this particular diagram does nothing for those of us who are mathematically impaired, no matter how much we love all topics that pertain to Ancient Egypt! 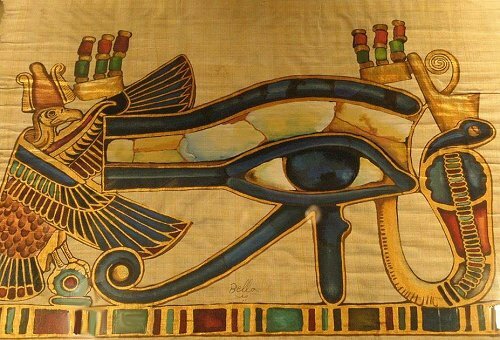 Another symbol of the Eye of Ra in specifics is the sun disk that appears on the heads of solar deities in the Egyptian pantheon, such as Sekhmet, Horus, and even Ra Himself. The sun disk and the Uraeus at the centre were protective and punishing at the same time. The sun or Ra moving across the sky could be found in the symbolism of the Solar Barque, which carried Ra across the sky each day. In the Barque of Ra or the Solar Barque, other deities rode with Ra. Certainly the body of the heavens was equated with the Celestial Cow who travels with Ra.